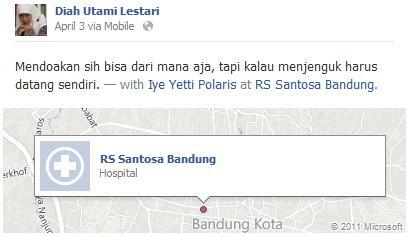 April the 3rd, we could still visited her in the High Care Unit Santosa Hospital, Bandung. And last night, I heard the sad news. Mdm. Elly, mother of Farhan (P4 Iman) and Fauzya a.k.a. Fia (P2 Iman), has passed away. Innalillaahi wa inna ilayhi raaji’uun. The graceful mother has been fighting leukemia that she had all this time. Her health suddenly dropped in a very short time. We heard news about her being transferred from ER, moved to the treatment room, ranging to ICU, had entered the regular room regular, then the HCU where we saw her some time ago. In a special treatment room, her children were not allowed to see her. No kids allowed in the special care unit. Really, I can not imagine how their might be longing to see each other. A mother who could not meet her son and daughter, and vice versa, it must be painful for them. “Please take care of Fia…” Mdm. Elly said weakly when ms. Yetti visited her. Fia which was in her class, not even 8 years yet, while his brother, Farhan, I think he hasn’t been 10 years. They were both very young, still need guidance and warmth of their mother’s arms. But God’s plan is inevitable. Mdm. Elly’s ‘battle’ should stop on Saturday afternoon. A funeral was set up to take place in Garut on Sunday morning. Allahummaghfirlaha warhamha wa’afihi wa’fuanha. May Allah accept all good deeds of her, and place her in the best place. The prayer was spoken to the family-especially the children- who are left behind. May they steadfastly, and be patient accepting God’s destiny. Hopefully God will rejoined us all together in the heaven later. Ameen. Be righteous and pious children, will you, kids? So it could become her investment of your mother’s good deeds. This entry was posted in Uncategorized and tagged children, condolence, death, faith, my students. Bookmark the permalink.